The cost of energy is steadily on the rise and our natural resources steadily on a decline here in the U.S. and around the world. The Environmental Protection Agency estimates that buildings in the US Account for 39% of the total energy consumption, 12% of the total water consumption, 68% of the total electricity consumption, and 38% of the carbon dioxide emissions. Building green incorporates total environmental consideration and resource efficiency into every aspect of site and construction development. Beginning with the design phase, the building site, building orientation, construction components, indoor air quality, and energy consumption of the building, are all the components that will positively impact the energy and resources consumed by the home or commercial structure. Yes, green building will add to the costs of the structure. The analytical method calculates costs over the buildings useful lifespan and must be considered during the design phase. The lower operations costs applied over the life span of the building will recover the initial expenditure within a predetermined period; this is of course considering the buildings use. 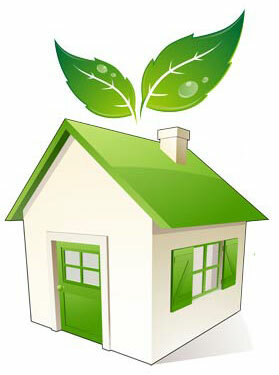 However, there are many green elements that may be incorporated into the design with little or no additional costs. Energy savings of 10% to 20% can be achieved by improving the thermal transmission (heat flow) of the building envelope as applied to windows, outside air infiltration, roofing and insulation. Selecting Energy Star appliances LED lighting and high efficiency HVAC equipment with a SEER of 14-18 + will substantially reduce the energy consumption? 1. Tax incentives that are offered by The Federal Government and local utility companies. 3. Healthier indoor environment with increased air quality. 4. Safer indoor environment from low emitting materials. 5. Use of regional materials and recycled products. Commercial structures can earn a deduction of $1.80 dollars per square foot that achieve a 50% reduction in annual energy consumption, compared to a base building defined by the industry standard. Improvements to any one of the three building systems, the building envelope, lighting or HVAC systems that may reduce the energy consumption by 16.66 % can obtain a partial deduction of $ .60 cents per square foot. The design criteria as applied to a defined building standard, may vary the actual annual operational costs, dependent on building use. This does not imply, that a substantial annual costs saving will not be realized, by utilizing the Green Building Standards of LEED. Southern Estates Homes is a Member of The South Florida USGBC for Broward County. Call us to have our qualified staff assist you in planning your GREEN Project from concept to completion. Contact our office for further information on any questions you may have, and to schedule a consultation for your project.